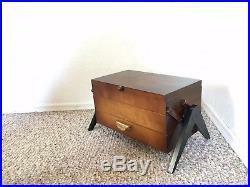 Vintage Sewing Basket Box Knitting Crochet Mid Century Wood German Accordion retro storage. 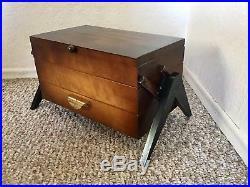 Vintage wooden sewing basket/knitting box imported from Germany. 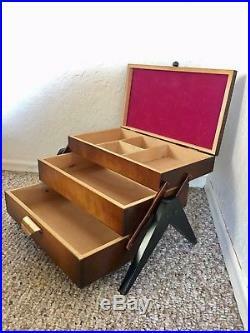 This is an original mid century item, not a reproduction. Perfect addition to complete your mid century look! 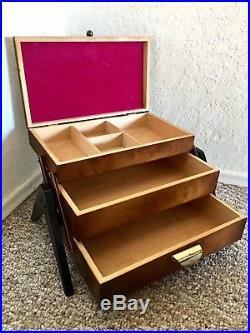 This sewing box features 3 compartments in total. 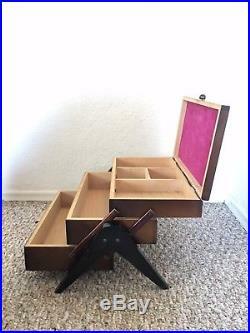 1 compartment divided for smaller objects. 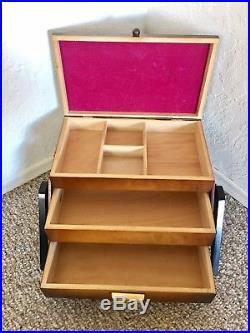 2 larger compartment on the bottom for bulkier pieces. 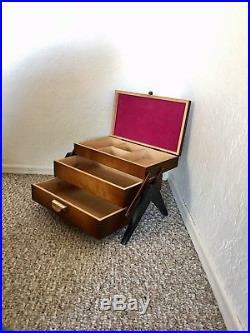 This lovely piece could also be used as a fancy jewelry organizer or a make up box for example. 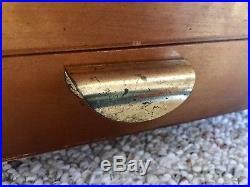 Age appropriate patina on handle, please see picture. 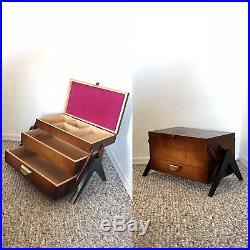 The item "Sewing Basket Sewing Box Accordion Mid Century Knitting Storage Vintage Retro" is in sale since Wednesday, August 8, 2018. 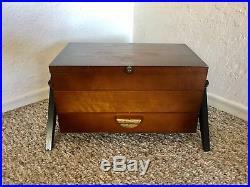 This item is in the category "Collectibles\Sewing (1930-Now)\Baskets & Boxes". 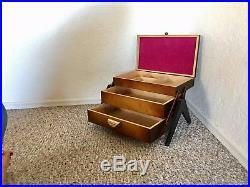 The seller is "xgollumxus" and is located in San Diego, California. This item can be shipped to United States, Canada, United Kingdom, Denmark, Romania, Slovakia, Bulgaria, Czech republic, Finland, Hungary, Latvia, Lithuania, Malta, Estonia, Australia, Greece, Portugal, Cyprus, Slovenia, Japan, China, Sweden, South Korea, Indonesia, Taiwan, Thailand, Belgium, France, Hong Kong, Ireland, Netherlands, Poland, Spain, Italy, Germany, Austria, Israel, Mexico, New Zealand, Philippines, Singapore, Switzerland, Norway, Saudi arabia, Ukraine, United arab emirates, Qatar, Kuwait, Bahrain, Croatia, Malaysia, Chile, Colombia, Costa rica, Dominican republic, Panama, Trinidad and tobago, Guatemala, El salvador, Honduras, Jamaica, Antigua and barbuda, Aruba, Belize, Dominica, Grenada, Saint kitts and nevis, Saint lucia, Montserrat, Turks and caicos islands, Barbados, Bangladesh, Bermuda, Brunei darussalam, Bolivia, Ecuador, Egypt, French guiana, Guernsey, Gibraltar, Guadeloupe, Iceland, Jersey, Jordan, Cambodia, Cayman islands, Liechtenstein, Sri lanka, Luxembourg, Monaco, Macao, Martinique, Maldives, Nicaragua, Oman, Pakistan, Paraguay, Reunion.